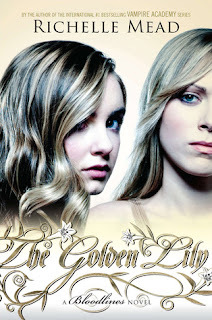 So, I've got some drama going on with Richelle Mead's The Golden Lily. First of all, Barnes and Noble messed up and sent me my pre-ordered copy 20 days early (read about that here), then I was afraid to start the book (read about my fears here). Finally, I started The Golden Lily. It was so good that I tried to pace myself to make the book last. I told myself I would read only 100 pages a day. That lasted for two days, then on the third day I gave in and finished the book. I loved Vampire Academy and I've been hesitant to delve into Bloodlines since I loved Rose's point of view so much. Your comments here have reignited my interest. What were your thoughts of the first book in the series, Bloodlines? There were so many mixed reviews and I would love to know what you thought. Thank you for your comment! I loved Bloodlines---read my review here http://www.idsoratherbereading.com/2011/10/book-review-bloodlines-bloodlines-1-by.html. It was not VA, but I loved it for what it was. Adrian was never my favorite character in VA, but he has really grown on me throughout Bloodlines. I think the books are most definitely worth your time. I have really started to like Sydney as a narrator! She is no Rose, but I like her in her own right. and i can't wait to crack open my copy. i have missed adrian!!! You don't have to wait a year, The Indigo Spell comes out in February! You can read the first chapter in special WalMart editions of TGL! !